Notes: Very rare to get two different postmarks of the same date franking the same stamp. The above Royal Mail Royal Wedding 1981 stamps were issued on 22 July 1981 by Royal Mail and feature the following stamp designs: 14p; 25p Portrait of Charles & Diana. 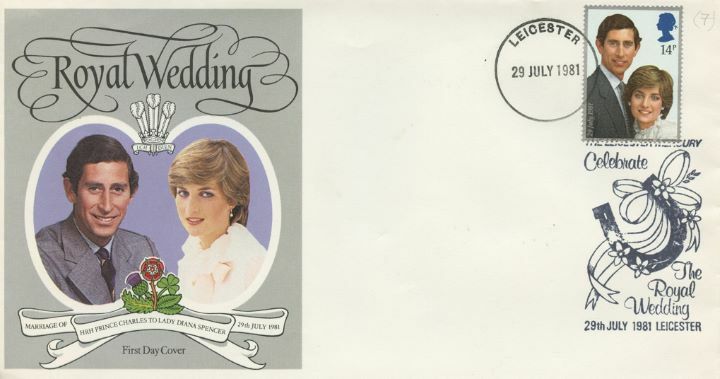 The Charles & Diana first day cover with the Leicester, Horseshoe and Ribbons, Special Handstamp postmark has been produced by Pres. Philatelic Services and features these stamps which can make a very collectible and lovely gift.